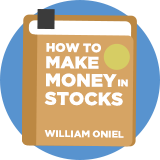 The William O'Neil CAN-SLIM-esque strategy is a growth investing strategy inspired by a proprietary model devised and owned by US investor and publisher William O'Neill. It focuses on growth metrics but also has a momentum component to determine when stocks should be bought and sold. The 7-pronged formula focuses on Current Earnings, Annual Earnings, New Highs, Products or Management, Supply & Demand for the shares, Leaders over Laggards in a sector, Institutional Support and Market conditions. William O'Neill wrote: "What seems too high and risky to the majority generally goes higher and what seems low and cheap generally goes lower." Studies by the American Association of Individual Investors in the US have found that investing rules based on O'Neill's approach have been some of the most successful over the last decade. The so called 'CANSLIM' acronym is a registered trademark of Investors Business Daily, and the approach has become famous and well followed in the USA. American entrepreneur, stockbroker and writer. Founded the business newspaper Investor's Business Daily. Author of 'How to Make Money in Stocks'.